In Tony Hillerman's 1984 Navajo detective novel THE GHOSTWAY, Jim Chee travels from east to west along Route 504, "through Teec Nos Pos, Red Mesa, Mexican Water, and Dennehotso." Currently, the route Chee followed aligns with U.S. Route 160, which extends between Tuba City, Arizona and Poplar Bluff, Missouri. In 1970, this route was bumped south from its original alignment in southern Colorado, absorbing numerous subsidiary Four Corners highways in the process. Today, Teec Nos Pos, Red Mesa, Mexican Water, and Dennehotso are all located along US Route 160, where it cuts across the Navajo Reservation as it travels through northeastern Arizona. There is a an Indian Route 5043, which heads south from U.S. Route160 toward Pastora Peak, which lies several miles southwest of Teec Nos Pos. 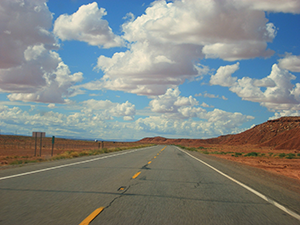 "Westbound Highway 160, near Kayenta, AZ, September 14, 2006" by Sarah Nichols is licensed under CC BY-SA. 1987 U.S. 160/163, S.R. 98/564 Corridor Study. Phoenix: Transportation Division. Success. Roads & Bridges 54(3).